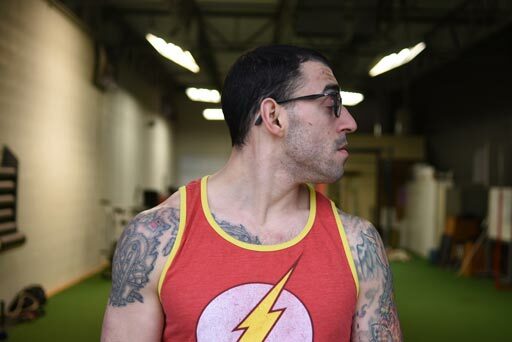 General functions = “this part of the body does x.” We begin here to give you a frame of reference as it’s a good way of teaching movements produced by any muscle. 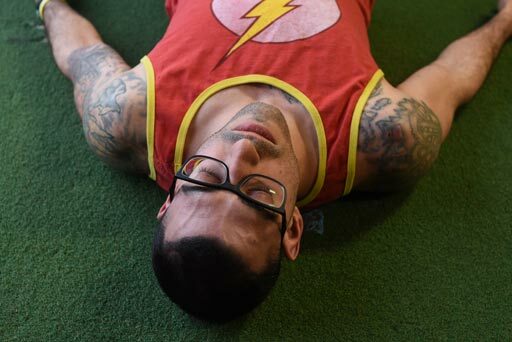 Imagine you just finished a killer workout. You’re lying on your back, struggling to catch your breath. Heavy breathing, heart pounding, think you’re going to take a #2 in your pants–you know, the whole shebang. Those heavy breaths? Both your left and right sternocleidomastoid muscles helps you take those breaths. You’re now so tired that you cannot feel your feet. You lift your head up to look down and make sure they’re still there. This is flexion of the head. Both of your sternocleidomastoids contract at the same time to help you do this. Your training partner just finished their set. He feels the exact same way that you do, i.e. like doggie doo doo. He plops down on your left, gasping for air. You turn your head over to look at him. You laugh. Misery loves company. 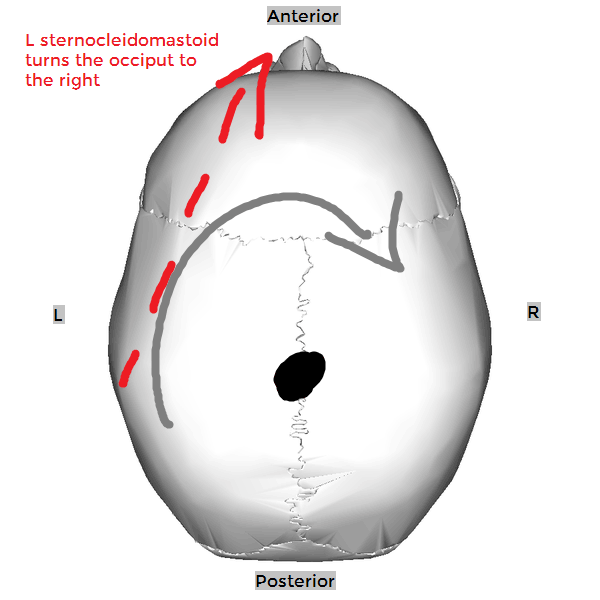 This left rotation of the head is driven by the right sternocleidomastoid. You’re starting to catch your breath. You still feel like death, but now enough oxygen is making its way to your brain for thoughts to enter you mind. That tilt to the left is left lateral flexion of the head. Your left sternocleidomastoid helps you do this. Ten minutes have passed. You grab your phone now that you’re coherent again and walk over to the nearest chair. Why? Because it’s time to brag about your workout on Snapchat. Obviously. You slouch down and bring your eyes in to focus on your intelligent phone on which you spent so much of your hard-earned cash. We call that protrusion of the head. Both your left and right sternocleidomastoid muscles help you do this. Okay, so we’ve briefly discussed basics and gotten our frame of reference. 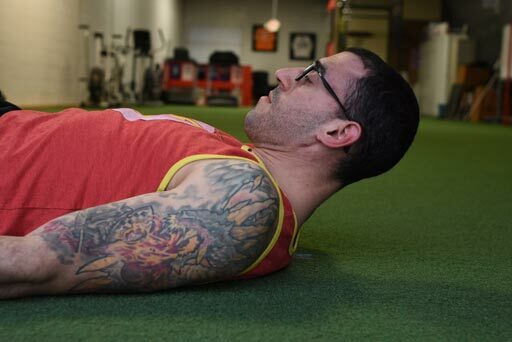 Now it’s time to dive into some more specific movements that these muscles can produce. Put on your spatial reasoning cap. We begin with some of the more direct influences from these muscles. That is, what are the specific movements that occur when we change the position of the sternum, clavicle, or base of the cranium. Forewarning: we’re going to use science talk. I gave a little intro to anatomical planes and axes, terms of motion and location over on IFASTU. Plus there’s a totally free post on getting started learning anatomy. This is that thinking head tilt we talked about earlier. The temporal bones are connected to the occipital bone by immovable (or mostly immovable1,2) sutures. The occipital condyles then rest in the superior articular facets of the first cervical vertebra, known as the atlas or C1. Top view of the atlas. Note the shape and placement of the two superior articular facets, i.e. concave and shifted anterior. It’s like two hands holding a bowl. 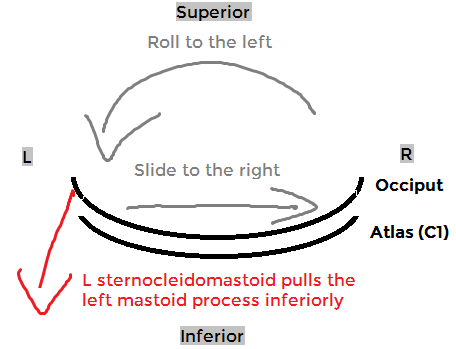 When a left sternocleidomastoid pulls the left mastoid inferiorly, the occipital “bowl” rolls to the left and slides to the right. 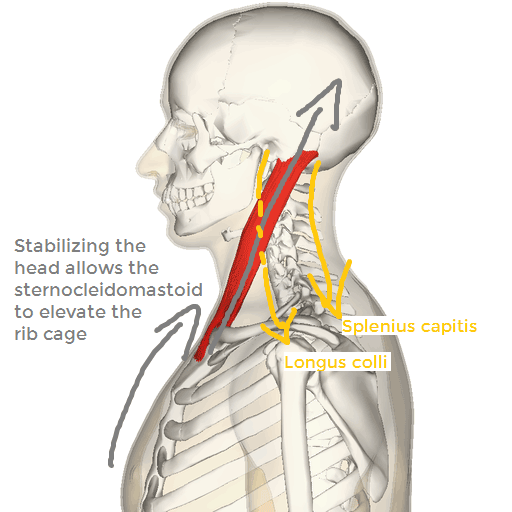 If the thorax is fixed still, unilateral shortening of the sternocleidomastoid moves the head. If we look down from the top, the rotation moment is readily apparent. The other primary movement is the one we just talked about above: ipsilateral OA lateral flexion. 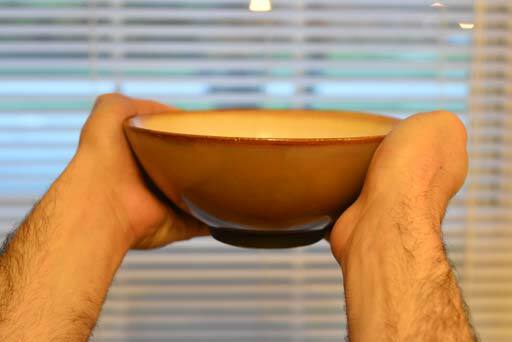 Remember the hands holding the bowl? There are two major points of contact that determine OA movement. If the occiput rotates to the right atop the atlas, each of these sides must be doing the opposite thing. These movements are not exaggerated. They are, frankly, difficult to picture in your mind, much less to see with your eyes. The point is to understand normal OA joint motion. 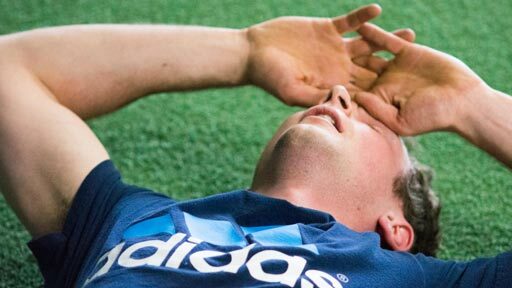 It’s easy to palpate your SCM during rotation partially because the muscle contracts, but mostly because the movement of its attachments makes the muscle belly more prominent. Let’s use some other muscles to stabilize the head. Maybe splenius capitis and longus colli. Something like that. Or better yet, let’s just put our hands on our head. That’s usually what we do when we’re tired from a tough workout. Okay, now that we have the head anchored, let’s pull up on the inferior attachments of SCM. The clavicle rises. The sternum rises. This one is best when viewed from the side. We put an axis of rotation through the occipito-atlantal (OA) joint, draw an arrow to indicate the force vector of the SCM, then draw a line from the axis that runs perpendicular to the force vector. This one is counterintuitive because you wouldn’t think the SCM would help at all with extension of the head or neck if it’s active in flexion of the head and neck. Not only is there an O-C3 extension moment arm, but that moment arm gets even longer as the upper cervical extension increases3. Nuances like this excite me. We have incredibly intricate joints in the head and neck. Here is where the flexion of the entire head complex really makes sense. Pull the freaking thing forward. We’re going to dive much deeper into this in a short while. Now it’s time for nuance. This is the stuff that really excites me. We’re going to extrapolate our understanding of science to think about why some things might happen. What is going to drive unconscious behavior? We have to think about physiology, genetics, diet, experience… context matters. As a muscle of forced inhalation, the SCM can pull the sternum superiorly. We’ve already discussed this, and hopefully it makes sense to you by now. The SCM can also affect the first rib: pull the clavicle up and the first rib follows. How? The clavicle is connected to the first rib by the subclavius muscle. The other ribs are connected by intercostals. This explains the head flexion function. SCM has a huge moment arm on the lower cervical vertebrae, roughly from C3 to T1, and that moment arm only increases as the head flexes forward3. Here is actually where most of the rotation comes from4. The interface between the occipital condyles and superior articular facets of the atlas is considerably congruous. That is, there’s a lot of occipital bone close to a lot of atlantial bone. This congruence limits movement of the occiput on the atlas. The two lateral joints are basically two balls sitting on one another. There is a capsule surrounding each joint that helps limit motion. 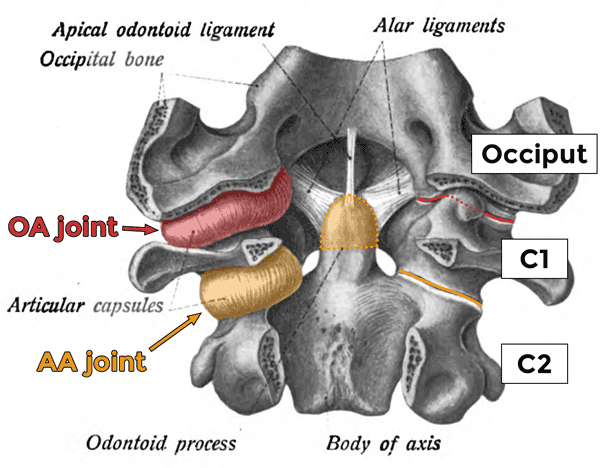 The one median joint is made by the anterior arch of the atlas and the odontoid process of the axis. It’s super weird; here’s a picture. 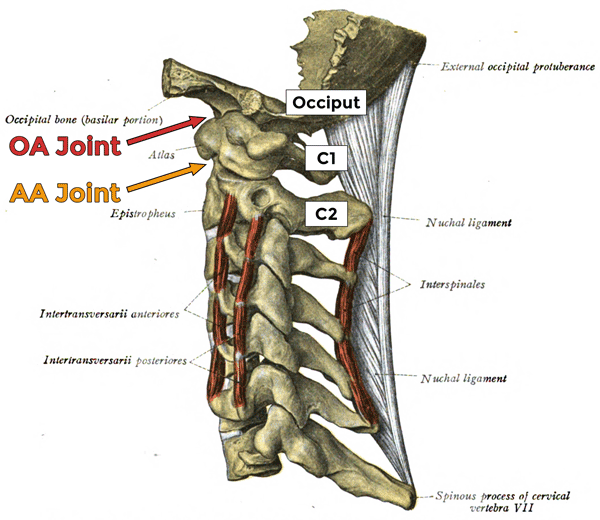 The two occipitoatlantial (OA) and three atlantoaxial (AA) joints. Posterior view of the anterior portions of the occiput (top), atlas (middle), and axis (bottom). The posterior portions of these bones have been removed. 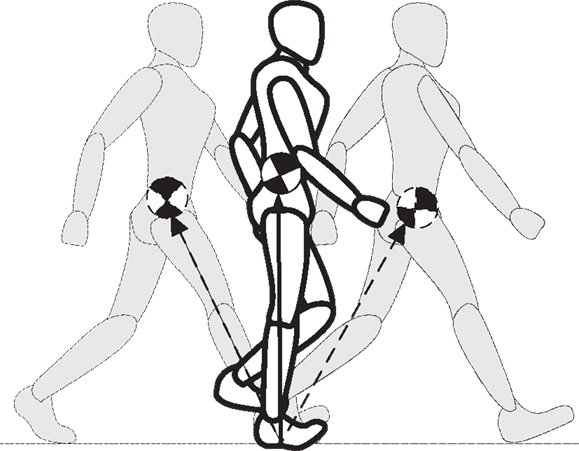 When the atlas rotates, the two lateral joints move either forward or backward, but also inferiorly. It’s like the inverted pendulum of human walking since the center of mass is highest when in the middle. 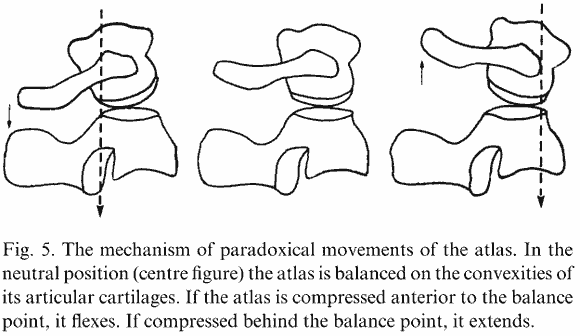 As the atlas rotates to the right, the right lateral joint slides posteriorly and inferiorly. The left lateral joint slides anteriorly and inferiorly. The entire atlas sinks down towards the axis. From Bogduk and Mercer, 20004. The dotted line above shows the vertical displacement during rotation. Realize that the drawing on the left corresponds to right rotation of the head and the drawing on the right vice versa. Super interesting fact: the rotation of the atlas is limited by a structure that doesn’t even attach to the atlas! Though the lateral joints have capsules which restrict movement, most of the motion is limited by the alar ligaments surrounding the odontoid process4. Because of this ball on ball shape, flexion and extension is also kind of strange. When the occiput rolls anteriorly on the atlas, it slides backward. When the pressure of the occiput on the atlas rolls backward, it causes the atlas to do a wheelie, tilting backward into extension4. So even though the head is flexing, the atlas is extending. From Bogduk and Mercer (2000)4. When the occiput rolls forward (flexes), it slides posteriorly. The dotted line on the left is the occiput’s weight due to gravity. The scenario on the right corresponds to the opposite, i.e. OA extension. What happens to the rib cage when you take a breath in? You increase the volume of your thoracic cavity. This is, once again, an illustration of seemingly unrelated physics translating into movement. To create air flow, I create a pressure gradient. If the SCM is driving my inhalation, it’s pulling up on the front of the ribs and sternum. What happens to the thoracic spine when the ribs rotate this way? They tilt backwards. If I want to open the front of the thorax, I close the back of the thorax. Diane Lee talks about the thorax in depth5,6. In the case of a “retruding atlas”, it’s not that there’s tremendous movement. If there’s any movement at all, it’s subtle. What we’re talking about here are joint torques and drivers of movement. Let’s say you’re working with a client who is really flexible. 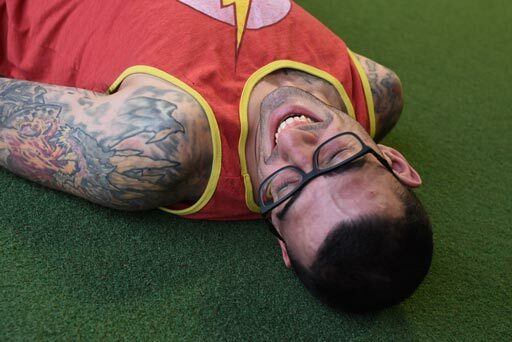 Maybe they stretch a lot or they have Ehlers-Danlos syndrome. They may hyperventilate so that they can compress their neck and feel more. Here’s where you can step in and teach them a more appropriate strategy for dealing with life. The forward head position can be adopted simply to keep your balance. Think about the way a third base coach slouches and sits on his hips. Some might also call this a “swayback posture”. The pelvis moves anteriorly. The thorax moves posteriorly. The head moves anteriorly. 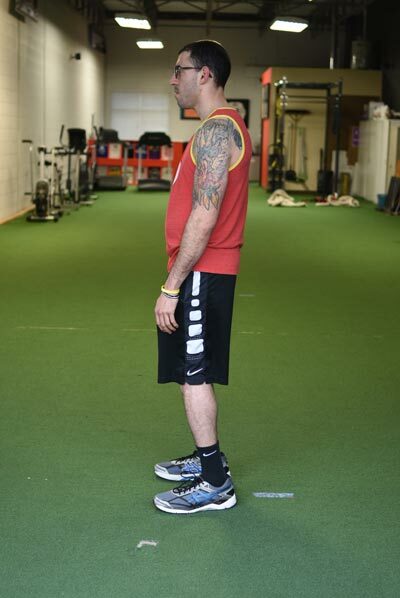 These movements all counteract one another, giving you a net balance of your center of mass over your base of support. Imagine if you didn’t have this reciprocal postural compensation when pushing your hips forward. Your whole body would tilt forward and you would eventually fall over. When we look at something, we focus on it. Our pupil diameter changes and our eyes will converge closer together or diverge further apart, depending on how far away we’ve placed this object of interest. When reading, we can’t place the book across the room because our eyes are not capable of detecting that level of detail from that far away. We bring books within arm’s reach to give our eyes more data on the object of interest. In this case, that object is a page of text. Based on the nature of lenses, photons bouncing off of the things that we see come from all over the place. Only a small portion of these photons come together on your retina. The rest come together either too soon or not soon enough. It’s like mama bear’s porridge that was juuuuuust right. Only a small part of the retina is considered the region of highest acuity. We call this the fovea centralis. Without it, reading gets more difficult7. If our book or phone is not placed in the spot where fovea utilization is maximized, we strain harder to read the words on the page. This “optimal” spot is, at least based on my perception, pretty uncomfortably close to you. My default is usually, instead, to push the book back a little further, then slouch down and push my head forward. Once I do this, I don’t feel so crowded by the book and I’m utilizing that fovea acuity. This takes the stress off the eyes and puts it on the neck. Now, talking about sitting and reading posture could be a whole post in itself. I personally don’t want to be in this position for very long. When I realize I’ve done it, I move my chair closer an sit up a little “taller”. Maybe I’ll raise the book up, too, to cut the stress down on my neck. Reading is just one example. Can you think of any more? If the cranium moves forward, the mandible follows Newton’s laws of motion and attempts to stay in place. This is then considered relative motion of the temporomandibular joint. That is, a temporal protruding on a mandible. We could also flip it: if the mandible is driven backward by the way your teeth come together, it’s as if the head is being driven forward. What’s reaaaaally cool is that this occlusion can also have an effect on your posture, balance, and vision8–10. Mandibular position can affect the diameter of your airway, but so can other things. 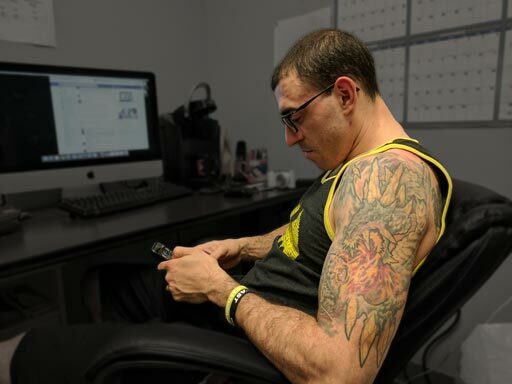 Imagine, for example, that your favorite internet author is named Lance. He’s currently having an allergy flare up. His airway is inflamed and the mucosa lining the airway is thickening. Thickening of structures inside the tube means the hole in the tube gets smaller. Now it’s more difficult to breathe. Maybe we have a diagnosis of asthma (as I indeed have). So now that I have this asthmatic Training Mask lining my throat, taking a breath in becomes laborious. Recall that SCM assists in forced inhalation. How can I make SCM into an even better respiratory muscle? I can push my head forward, that’s how! 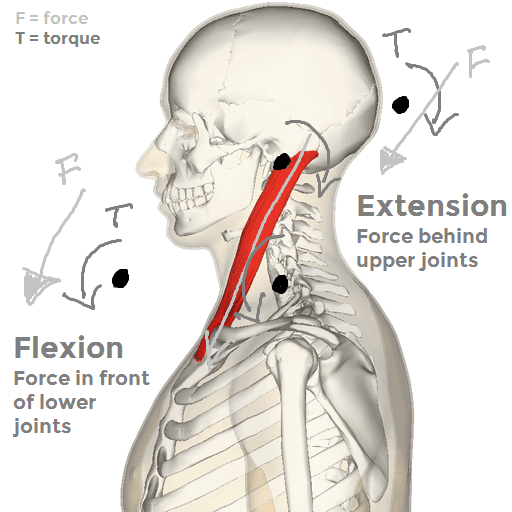 This increases the vertical component of sternocleidomastoid’s force vector, directing more of the muscle contraction to be used to elevate the rib cage11. Maybe, instead of breathing harder, you want to literally take the path of least resistance. 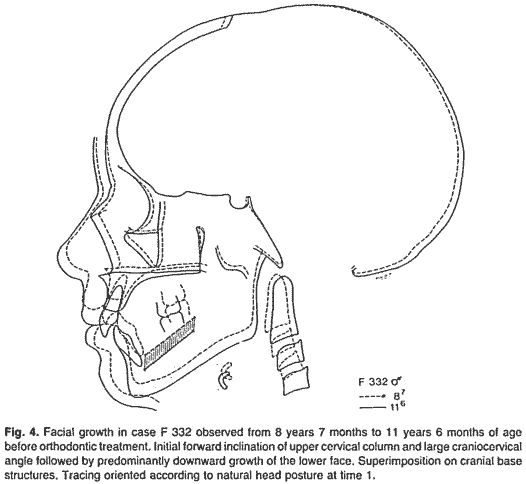 Increased cervical lordosis and craniocervical inclination opens up the pharyngeal airway12. And if your nose is clogged, you’re going to extend your head13–15. Hellsing et al (1986)13 did not find statistically significant EMG activity change in the SCM, though. 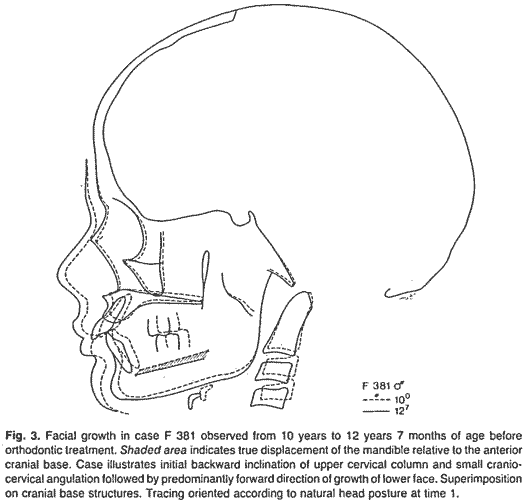 Some research shows a flattened cervical spine is correlated with posterior and inferior growth of the mandible16. If, however, a normal cervical lordosis was present, the maxillae would grow forward, increasing airway dimensions16. As the mastoid gets pulled forward and tilted backward, the infrahyoid muscles yank on the suprahyoid muscles which yank on the mandible. The mandible then tends to stay in its position while the temporal bones move forward. And the worse the asthma, the more the mandible retrudes17. We can take any of these head movements and follow them all the way down to the foot if our working memory is strong enough. Example: Rothbart linked feet and cranium18. As another example, if I have you look all the way to the right and continue to turn your body around so that you’re eventually looking behind your, your right foot will supinate. We could riff on this for eternity. It’s exhausting and we’d have to take breaks, but we could do it. All motion affects something. Even though the SCM only attaches to the temporal bone, it still acts upon the occipital bone. This extrapolation is easy to accept because there is (a) a strong congruence of the lambdoid suture, and (b) minimal other things that could be getting in the way since we’re only jumping across one joint. Jumping all the way down to the foot is less accepted. There is good reason for this since the more joints we jump, the more room there is for some fact of reality to come in and interfere with the kinetic chain of motion we’re discussing. Denial of this chain and the possibility of effect, however, is asinine. We’re talking about possibilities, not absolutes. Joint positions change. Hydrogen ion concentration levels change. The weather changes. The president of the United States changes. All of these have an effect on what the head and neck are doing. In anatomical position, we have a pretty good understanding of what gravity is doing to the body. We discussed the reciprocal motion in the sagittal plane of the atlas under the occciput. How does this change when someone lays down? Or when someone stops violently in a car? Or when someone has back spasms? Or when someone has had plastic surgery? Or when someone has a neurological disease? We take reductionist views to help shed some light on individual muscle functions and joint kinematics. If we stop there, we do not help anybody. Instead, we must take these reductionist views we gain from most research and move them to the field or gym. Pay attention to what your clients are doing. They are screaming information to you, but you will not hear/see/smell/sense it if you don’t listen for it. Observe, infer, hypothesize, test, and evaluate. Hopefully you found this post helpful. If you did, send it to someone! They might even thank you. If you don’t want to wait for me to write more of these, the best place to start is to get Neumann’s book and read chapters 10 & 11. Then read the Bogduk and Mercer (2000) article. This work and all images by Lance Goyke are licensed under a Creative Commons Attribution 4.0 International License unless otherwise noted.